In April 1983, Craft Supplies USA began a woodturning workshop program that has evolved into one of the finest in the world. Instructors are artist-craftsmen who have proved to be excellent instructors with knowledge and skill capable of producing turnings acceptable for galleries and discriminating collectors. Our state-of-the-art workshop facility offers individualized workstations complete with all the necessary tools, chucks, and accessories needed to provide a first class experience. Each workstation also has ample working room with on-demand air, dust extraction, and high intensity lighting for optimum working conditions. 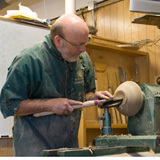 Workshop attendees often tell us that spending a week at a Craft Supplies USA Woodturning Workshop helped them learn in only a few days what would take months or years to learn on their own by trial and error. Remember – Practice doesn’t make perfect, Perfect practice makes perfect. 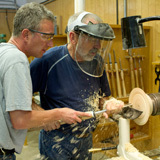 Why not set aside a few days and enjoy a fulfilling woodturning experience, as well as make some new friends?